It is not uncommon to find our mind wandering during yoga sessions. However much our yoga teacher asks us to fix our gaze, there will be times when our attention will waver. Our focus and attention have a greater significance than we realize. It has been rightly said that where our attention goes, energy flows. This holds true not just for our yoga practice, but life itself. When it comes to yoga, our attention must be directed towards our body, balance, alignment, breathing, and energy flow. But, if we remain involved with the external world, our Prana or vitality begins flowing out of us. To direct our life force inwards, control and focus of attention are essential parts of our practice. This is where ‘Drishti’ comes into play. The word ‘Drishti’ in Sanskrit literally means sight, direction, or insight. It means gazing or fixing attention at a particular point which helps us divert our outward focus inward. Ancient yogis stressed on the idea that wherever our gaze is directed, our attention naturally follows. Also, they expounded the amazing truth of reaching the mind and steadying the mind by working through the physical eyes or using “drishti”. When the gaze fixates on a single point within the body, the mind is not perturbed by the external environment. The mind is able to become “steady. ”Hence, the use of drishti enables us to move to a deeper state of concentration. Drishti is widely used in asana practice such as in Ashtanga yoga and it brings us closer to the fifth and the sixth limbs of yoga, Pratyahara (sense withdrawal) and Dharana (concentration). 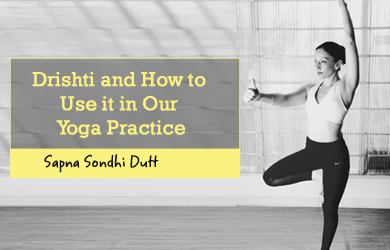 Drishti is one part of a three-fold approach to yoga described in Ashtanga Yoga. The three-fold approach called Tristana encompasses yoga postures (asanas), breath (Pranayama), and drishti. When drishti is constantly applied, it develops ‘Ekagraha’ which means single-minded focus, a fundamental yogic technique used to quieten the mind. Yoga teachers emphasize that drishti can help improve posture during yoga poses. This is because Drishti brings a focused gaze, due to which we can be more aware and present during our asanas. Drishti is incorporated in yoga poses by simply selecting a point of focus which will help us maintain the alignment and balance of that particular posture. Practising drishti is an art mastered over time. We begin with attention to alignment of the pose followed by synchronization of breath and finally begin to fix the gaze or drishti. Fixed gazing or drishti proves to be indispensable when we hold a posture for a prolonged period of time or while executing balancing poses. 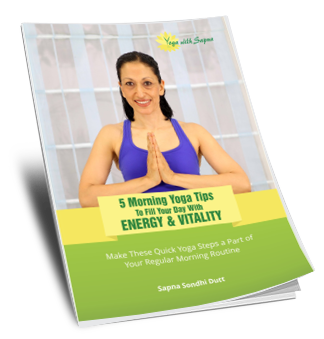 In Ashtanga yoga, there are 8 specific points that our yoga teacher will ask us to focus on. The first one is called the Nasagrai or Nasikagraha Drishti which requires the practitioner to gaze at the tip of the nose. This is practiced with postures like Urdhva Mukha Svanasana (Upward-facing dog pose), Vrikshasana , standing forward fold poses like Uttanasana. While meditating , we make use of the Ajna Chakra or the third eye. This is the Naitrayohmadya or Broomadhya Drishti. The third eye is located behind the middle of the forehead and is used as a focal point for the eyes in postures like the Fish pose or Matsyasana and many others. Gazing at the navel, also known as Nabi Chakra Drishti is practised in Adho Mukha Svanasana (downward facing dog pose). In Trikonasana (Triangle pose) and Virabhadrasana II (Warrior pose II), the focus is towards the hand also known as Hastagrai Drishti. Fixing your attention to the toes is called Pahayoragrai Drishti. This drishti is emphasised in many seated forward bends and Navasana (boat pose). In seated spinal twists, we gaze towards the sides while twisting to the left and right. This is called the Parsva Drishti. In the first movement of the Surya Namaskar or Sun salutation, our attention is directed towards the thumb and this is called Angushtha Madhyam Drishti. Upward or Urdhva Drishti requires us to gaze into empty space instead of any particular body part. 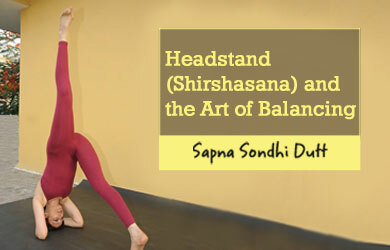 This is used in Virabhadrasana I (warrior pose I) and Utkatasana (Chair pose). Drishti is not just restricted to yoga asanas. The literal meaning of drishti in Sanskrit also translates to a point of view, intelligence, or wisdom. One can utilize the art of drishti to have a clear vision and create a life we truly want to live. To do that, we require focused attention towards our goals and drishti helps us to do just that. Practicing this yogic technique will help us control our mental fluctuations and stay tranquil during adversities. We need to remind ourselves not to strain our eyes while focusing on our drishti points during asanas. Our gaze should be not be harsh, but soft and gentle, maybe with the eyes semi-closed so that the muscles around the eyes remain relaxed while gazing. Drishti can be both externally oriented (Bahya) which is mostly what we do during yoga postures. The internally oriented aspect of drishti is called Antara and is used in meditative practices. Let’s incorporate this life-transforming practice of drishti in our yoga practice and also in our life!